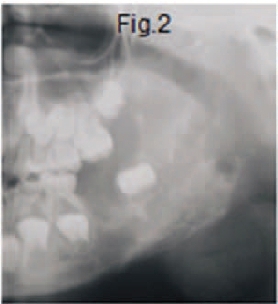 A 7-year old boy presented with a longstanding swelling in the region of the left angle and body of the mandible, (Fig.1) with associated tumour like nodules present within the oral cavity. The cropped pantomograph (Fig.2) showed numerous multiloc-ular radiolucencies, bony expansion and excess tooth eruption. 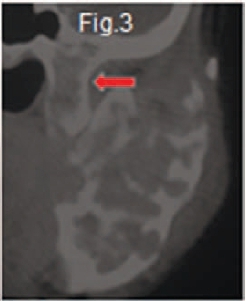 The coronal CT scan (Fig.3) confirmed the bony expansion of the lesion as well as the involvement of the pterygoid plates on the left side (red arrow) denoting an aggressive lesion which has spread beyond the mandible into the pterygoid muscle. On the MRI scans there was a high intensity signal in all sequences in both parpharyngeal fat spaces, indicative of slow venous flow in the severely congested pterygoid plexuses. 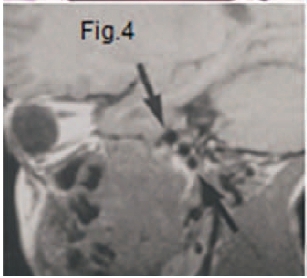 Figure 4 shows the tortuous nature of the flow-voids (arrows) visible on the sagittal projection on one of the MRI scans, indicative of the vascular nature of the lesion. A final diagnosis of central haemangioma was made. The facial bones are a common site for this very rare lesion. According to Langlais et al the literature is inconsistent regarding the various types of vascular lesions. They believe there are two groups of lesions: haemangioma and AVM's. Haemangioma may have been present since the first year of life, whereas arteriovenous malformations (AVM's) may develop in a teenager, possibly after trauma. 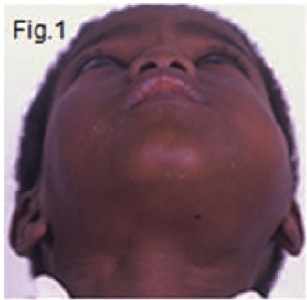 Facial asymmetry, especially over the mandible may result from swelling or hypertrophy. 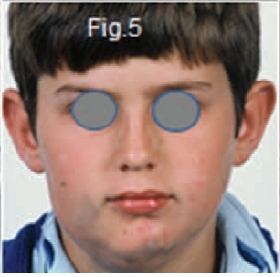 The skin or mucosa may be bluish, purplish, or reddish (Fig.5 & 6). Central haemangioma may yield blood readily on aspiration, whereas the pressure of the central AVM may drive the plunger out of the syringe. Lamberg et al (1979) discovered that 11 deaths occurred during treatment of central haemangioma. According to them extraction of teeth extending into a hematan-giomatous region seems to be the most common cause of fatal bleeding, and the tooth was a molar in all cases. In 8 of the 11 cases the operator was aware of or suspected a haemangioma. 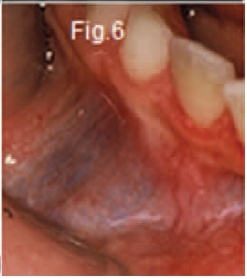 They also stressed the importance of suspecting this lesion in young patients with gingival bleeding and mobile teeth. In conclusion a certain clinician made the following statement regarding the presence of a haemangioma "When you press on a tooth in the presence of haemangioma it feels like pressing on a soccer ball".